Our next FREE class will be in the fall of 2019. Contact Mike Ferring if you have questions. Racing a sailboat is a kick. 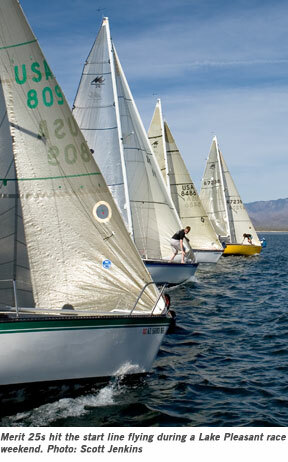 It combines the fun of sailing your boat with the raw competition of trying to beat someone else in a similar boat. Racing also teaches you boat handling and sail trim in a way that no amount of cruising could—by comparing your speed and handling side-by-side with other boats. True, the first time you see a sailboat race, you may think it’s too complicated and chaotic (it can be both). But like anything else new, you can grow into it step-by-step. This is designed to let you take a bunch of steps all at once. “I enjoyed it and learned a ton! You guys make great instructors.” — Ryan Kroelinger, Introduction to Sailboat Racing student. 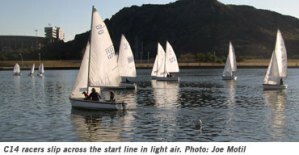 Who should take the class: Anyone who would like to sharpen sailing skills or sink your teeth into the excitement of sailboat racing. Even if you’ve raced before, you’ll probably learn new things about rules, tactics and procedures. Even if you only intend to crew or simply want to understand the game, you’re welcome in this class. Class description: This class will familiarize you with AYC race procedures and offer a crash course in, well, racing and not crashing. 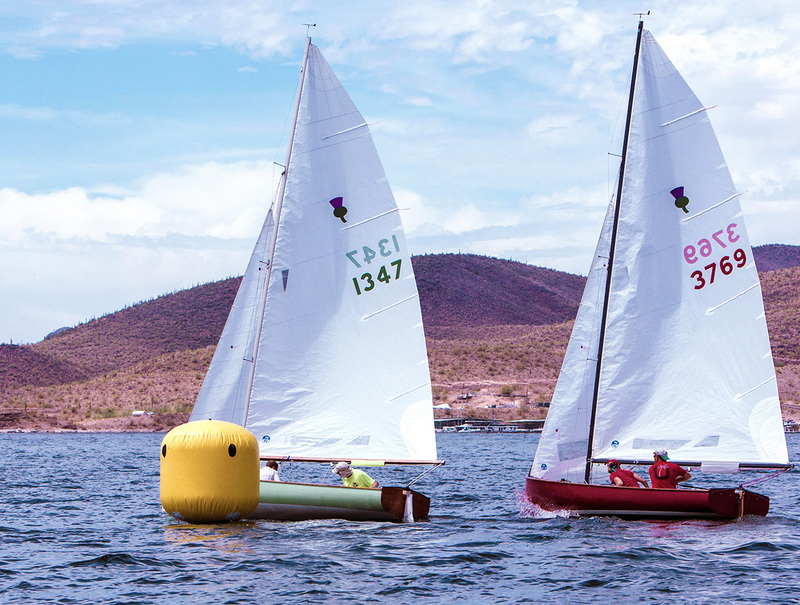 Because of limited time, the class can not include sections on making your boat go faster or on boat-handling, both of which are essential to winning races. But we can help. Class meetings: One classroom session for 2 1/2 hours at the Eisendrath House in Tempe. Here’s a link to the Google map location. The place is a little difficult to find, so allow a little extra time to get there. 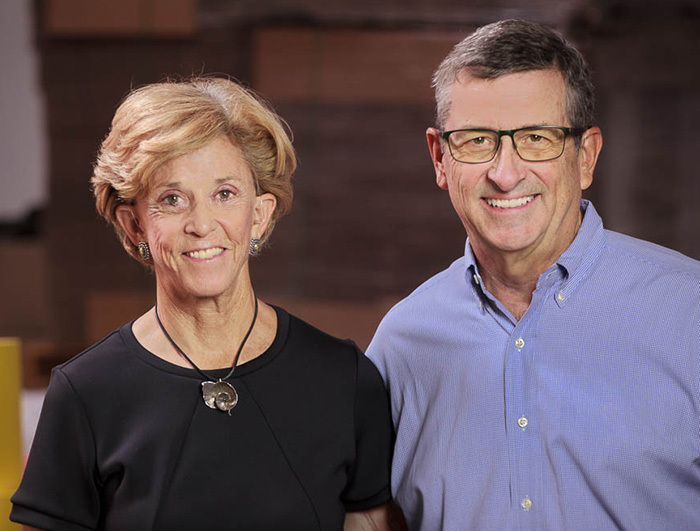 Instructors: Mike and Maryellen Ferring, both US Sailing Small Boat Instructors, originated the course and have taught it for over 10 years. Mike is also a certified powerboat instructor and has been a US Sailing-certified club race officer. They race a C14 at Tempe Town Lake and a J/70 at Lake Pleasant. They’ve won the 2015-2016 Sport Boat fleet championship and before that won another Sport Boat championship, four PHRF Non-Spin season championships and a C14 fleet championship.